Today we have an entrant for the first course of the Diced! competition. Contestants were instructed to create or find a recipe for an appetizer, soup or salad containing the following ingredients: Corned Beef, Canned Corn, and Corn Flakes. They were instructed to make their dish and create a blog post about it, including pictures. You can help determine who advances to the next round. After the last post, I will post a poll where you can vote for contestants to move on. Vote for the post you like the best. You can vote because of the inventiveness, the yummyness, the use of ingredients, the quality of the writing and pictures or for any other reason. The poll will be active for one week only. Check back and vote. In the event of a tie, the Ranting Chef will choose who advances. More information about Diced! can be found here. Dodo Book for Cooks – This is a great book for anyone in the kitchen. It has places to put your favorite recipes as well as handy conversion charts. When I first received the list of ingredients for the first round of the Diced! competition, I have to admit that my heart sank a little bit. Corn? Ok, I got it. Corn flakes? Ok, I don’t have those, but I think I can get them. Corned…beef…? Oh no. I live in Japan, a mystical land untouched by the majesty that is corned beef. Sure, I bet some import stores here and there have a few cans of corned beef. But when I considered the ridiculousness of travelling for an hour and half, switching trains twice, and then wandering through a monkey-packed shopping center to buy a single overpriced can of meat, I decided to go with a more cost effective and less maddening solution. I decided to make my own corn beef in my tiny little kitchen. So I pulled up my proverbial boot straps and went to look for a brisket. Apparently, they don’t have brisket in Japan. So I went with the largest cuts of beef I could find. What I settled on were two beautiful, slightly marbled pieces of beef round. I got my mitts on some pickling spices and a few other tasty seasonings, and then set out to retrieve the most important ingredient of them all: pink curing salt. And as (un)luck would have, that too doesn’t exist in Japan. It turns out nitrates, which indirectly give cured meat that beautiful pinkish red color and fight that age-old adversary we call botulism, can also be used to make bombs. Naturally, the Japanese government designated them illegal to import, buy, and sell. So I took off my chef hat and put on my chemistry goggles. Without pink curing salt, how could I make corned beef that wouldn’t kill/hospitalize me? I began with the knowledge that most leafy green vegetables contain trace amounts of nitrates. After a little bit of research, I discovered that the vegetable that is highest in these nitrates is none other than celery. Excited and somewhat skeptical, I went out and picked up a few stalks, braced myself for the possibility my end product would be a terrifying mass of inedible bacteria, and started on my corned beef making adventure. Start by peeling and mincing the garlic. Don’t worry, it doesn’t have to be super finely minced, it is just a seasoning for the brine. Add five cups of water to a large pot, then pour in the salt, minced garlic, brown sugar, and a tablespoon of pickling spices. While stirring, bring the mixture to a boil over high heat. While the brine is boiling away, fill your sink or a very large metal bowl with ice and water. After about ten minutes, pour the brine into a large, deep metal bowl and set it afloat in the ice bath. You may need to add more ice once or twice, but the brine should reach room temperature very quickly. Cut off the very bottom of the celery stalk and discard it. Give the celery a rough chop. The resulting pieces should be pretty small, but not small enough to considered diced. Set the beef in a large freezer bag or a tightly sealing Tupperware container. Once the brine is cool, pour it over the top of the beef. Make sure the brine completely covers the beef. Add the celery, then give the container a good stir with your hands. Make sure some of the celery gets under the beef and some of it ends up floating on top. Seal the receptacle containing your beef and put it in the refrigerator. Make sure to open the container and turn each piece of meat one time every day. After five to seven days, remove the meat from the container and discard the brine. Put the beef in a large pot and add just enough water to cover it entirely. Bring the contents of the pot to the lowest simmer possible. Cover and let the beef simmer for two to three hours over super low heat. Once finished, drain the water and allow the beef to cool. Use a very sharp knife to cut some very thin slices against the grain of the meat. A hearty scoop of mashed potatoes, some wilted cabbage, and a few slices of this corned beef make for a great hearty meal. I used my corned beef to create my own rendition of corned beef pie. Note: Pink curing salt is what gives corned beef its amazing pink color. without it, your corned beef will come out grey (just like mine did). As long as you included the recommended amount of celery, it is still completely safe to eat, so don’t worry. Melt the unsalted butter in a double boiler. Finely crush some cornflakes. They should be thoroughly pulverized, but you don’t need to turn them into dust or anything. A few chunks here and there won’t hurt anything. Mix the crushed cornflakes and the butter together. Press the resulting dough onto the bottom and sides of each pie tin. Do your best to form an even layer about two or three millimeters thick. Pop the pie tins in the refrigerator to firm up a little bit. Peel the kabocha and chop it into bite-sized pieces. Add the pieces to a pot along with enough chicken stock to cover them. Bring the stock to a boil, add the rosemary, cover, and then let it cook over medium high heat until the pieces are soft enough to be pierced with a fork or chopstick. Meanwhile, peel and mince the garlic. Add it to a frying pan with a tiny bit of butter and sauté until fragrant and soft. Set it aside. Drain the broth from the pot containing the kabocha pieces. Add in the garlic you set aside. Season the mixture with a little black pepper, powdered thyme, and salt to taste. Mash the contents of the pot. Add the heavy whipping cream. 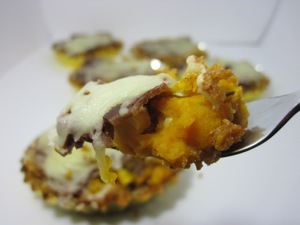 Depending on the temperature of the kabocha and the cream, the texture of the mixture can vary. If the result is too firm, add another teaspoon or two of cream. Be careful, though. 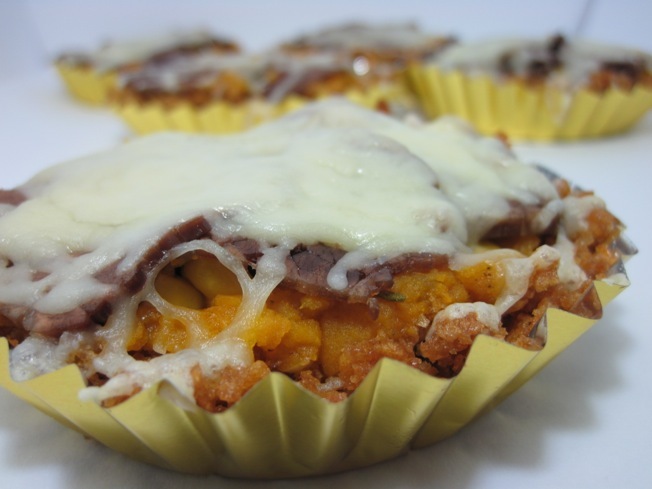 If the kabocha ends up too aqueous, it will make the cornflake crust soggy and unpleasant. Drain the water from the can of corn as best you can. Put the corn in a frying pan over high heat until it starts to blister just a little. Set it aside. Cut some very thin slices of corned beef. Build the pies in very thin layers. 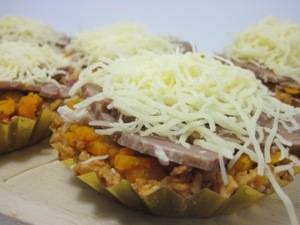 Add a layer of mashed kabocha, a layer of corn, a layer of corned beef, and a layer of shredded cheese to each crust cup. Bake each pie for five to ten minutes at 190 degrees Celsius (or until the cheese is completely melted). Serve each pie while still piping hot. These little guys are meant to be eaten right out of the tin with nothing but a fork. i’m participating in my first ever cooking competition. the showdown is titled “diced!” (named for its food network counterpart, “chopped!”), and it is being hosted on none other than the illustrious Rantings of an Amateur Chef. i am one of six participants. here’s the part where i need your help. the four contestants who get the most votes on the polls move on to the next round. it would be absolutely excellent if i could be one of those four. so if you have the time and feel like extolling the virtues of pmk, swing on by Rantings of an Amateur Chef, like my post, and tune in on the 7th this month to cast your vote for me. Brilliant! 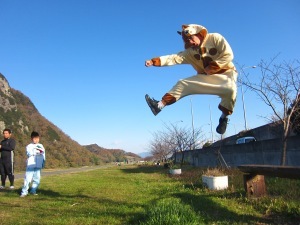 I’m on my way over to “like” your post. Nice work on the corned beef! I liked this recipe because Misha made his corned beef from scratch and incorporated another delicious healthy veg in his dish to counteract the starchy corn, a required ingredient. Top points for presentation as well. I love the nonedible “pastry” shell. I usually eat only the pie filling and toss the pastry, anyway. Good luck, Misha! 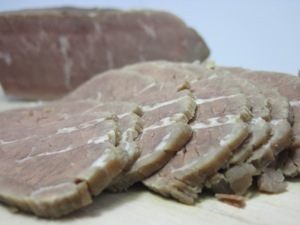 PS – Using celery in your corned beef brine instead of nitrates is just brilliant!!! Great choice, Misha! Can’t wait to try this one.